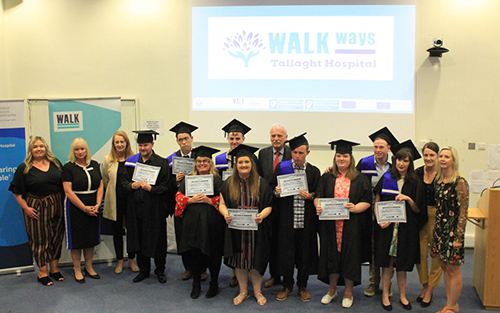 The Trinity Lecture Theatre hosted a very special graduation ceremony at the end of August as Tallaght University Hospital WALKways trainees graduated having completed their 11 month internship. The WALKways Tallaght University Hospital Programme is a transition programme for adults with intellectual disabilities to gain employability experience in order to access paid employment in the open labour market. Commenting on the programme Sharon Larkin, Director of HR said “We are delighted with the difference participating in this initiative has made to our working environment. The feedback from staff that have been involved has been overwhelmingly positive, the interns have developed their employability skills and lifelong friendships have been made. On behalf of all the staff in the hospital I would like to congratulate the interns on their graduation and wish them every success in their new jobs or next work placement. “We are looking forward to welcoming the next group of interns and continuing to provide a worthwhile and fulfilling internship. The success of this very worthwhile project is attributed to the way the staff of our hospital embraced it from planning to implementation and I sincerely thank all of the Departments that are involved.